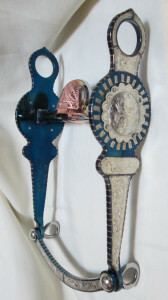 This is a Las Cruces modified western show horse bit made with GERMAN SILVER inlay instead of silver. It is made of steel with a Blued finish. Total length of shank is 8" long. This particular one has MP-07 (Salinas MP) which is a low port mouthpiece with copper cricket & hood and no tongue relief). The mouthpiece is sweet iron (which horses love) and bit ends with a slobber bar. However, you can use the drop menus to order your bit per your needs - using the many options available below. If you need help placing your order, please contact us at (209) 492-0114 or 1 877 587-4583.